This page is my answer. 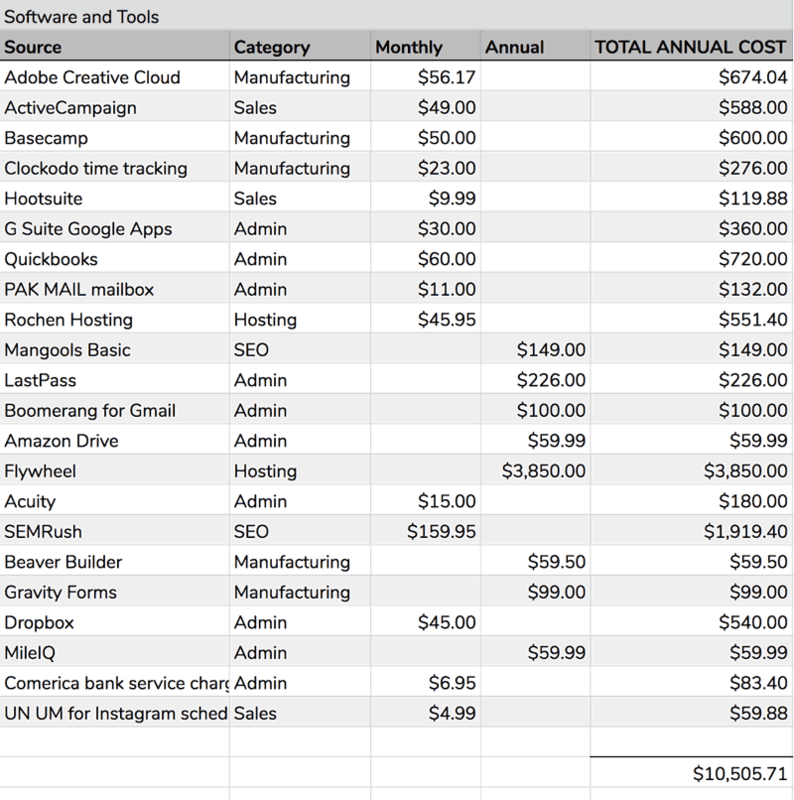 Below is a list of every single tool and service my business pays for on a subscription basis, to run both my generalist web design agency and my niche SEO business. I want to share exactly what I pay, so you know the real costs of doing business. I hope it helps you make some decisions about tools you might like to try to streamline, automate, and serve clients better. I absolutely love Basecamp 2 and have used it since 2014 to manage almost every web design and SEO project. It is so simple, and does everything I want but nothing more. I actually tried to switch away from it to something more feature-rich (Teamwork) a couple years ago, and found the alternative too confusing for me and way, way too confusing for my clients. You may not know that Basecamp 2 is still available for $50/month for 40 projects, which is what I use and love. Basecamp 3 is $99/month for unlimited projects and a lot more features, which I don’t think I need. We host almost all of our websites and clients’ websites on Flywheel. The only sites that aren’t there are ones on cheap reseller hosting I bought before we started with Flywheel. I’m so committed to it, I require web design clients to host with us or on Flywheel, or we refer the work to someone else. I jumped on board with Flywheel early on, in 2014. I absolutely love their simple and well-designed dashboard, single FTP login, one-click SSL, and friendly support team. The 50-site bulk plan we have with Flywheel is the single most expensive thing I buy in my business every year. In the last year, I have been feeling that they’re growing faster than they can perfectly manage. I’ve seen some missed backups and heard of a few random issues from friends. I’m not as over-the-top of a Flywheel fangirl these days, but I still can’t bring myself to switch—I think their dashboard and ease of use for designers and web service providers is unmatched. If you have any questions about my experience with Flywheel, please feel free to contact me. I don’t know if I love it, but necessary. I use it mostly for Photoshop to resize images with its Save for Web feature and batch image processing. The designer on our team uses Photoshop, InDesign, and Illustrator for web, graphic, and print design projects. As a niche business, I get a lot of inquiries that don’t quite fit the type of work I’m looking for. If I don’t know anyone personally to refer the prospect to, I generally send them a link to Codeable. There, they can post the job and get multiple bids from vetted WordPress developers. More coming soon! Let me know which tools you want to learn more about. PS: You know it, many of the links on this page are affiliate links. That means I may make a small commission if you click through my link and buy these tools. Know that these are tools I really use and pay for myself and wouldn’t recommend otherwise. Plus, I feed Jetta a cookie every time we get an affiliate payment, so don’t deny her her joy.